Sephiroth, Cloud, Lightning... I choose you! The Final Fantasy series is now joining the likes of Pokemon, Yu-Gi-Oh, and Magic: The Gathering with an official trading card game of its own. Square Enix and Hobby Japan have announced that the characters from the iconic RPG series will become a lot flatter come early 2011. Final Fantasy: Trading Card Game has only been advertised for release in Japan as of now, and details on how it will work are light. However, we do know that it'll feature popular Final Fantasy characters such as Cloud, Sephiroth, Zidane, Kefka, Lightning, and Tidus. On Hobby Japan's website, these characters are listed as being from Dissidia: Final Fantasy instead of their canon Final Fantasy entries, so the TCG might be tied to the PSP brawler in some way. One character has been shown that wasn't in Dissidia, Rikku from Final Fantasy X, and others such as Aeris and Yuna are teased in silhouette form, but they could be featured in Dissidia's sequel. Can you guess the rest based on those silhouettes? Square Enix says that the TCG's gameplay will be closely tied to the Final Fantasy characters' unique skills and summons. My guess is that you'll plop down a few major characters and battle it out against your opponent's, fighting a turn-based battle until a team's hit points are completely gone. That might seem a little extreme, I know. Square believes that the cards will become collector's items because they'll feature "larger artwork" than similar trading card games. If it really wants to make some money, all it has to do is make Cloud and Sephiroth super-rare cards, but that'd be cruel beyond measure. 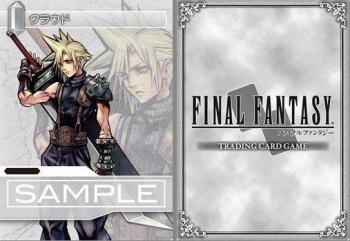 Final Fantasy: Trading Card Game will be released in Japan on February 25, 2011.